Young designers will understand how to create different skirt silhouettes. Young designers will understand changing orientation and mentally manipulate shapes in both 2D and 3D. This activity develops spatial visualization, which is important to apparel designers. This activity uses a series of half-scale fabric skirts. Download each pattern file and sew the half-scale skirt. There are four skirts: flared, gathered, fitted, and peg. Create one set of skirts for each team. Each team also needs at least one half-scale dress form. Half-scale dress forms are expensive to purchase. One solution is to make your own (see DIY Dress Form). Also, you may borrow from a college in your area, or watch for online bargains. You can find websites with instructions for making half-scale dress forms from plaster, duct tape, and paper mâché. You may also substitute dolls that the young designers have on hand, but they will not be true half-scale. Young designers are in teams of 5-7, with one leader per group. In this activity young designers will make four tissue paper skirts: flared, gathered, fitted and peg. Wrap the sample skirt around the dress form, without showing what its flattened shape looks like. Ask the young designers to observe the way the skirt fits around the body. Discussion Point: Where is the fabric close to the body? Where is it away from the body? Mood board: a collage of images that young designers use to convey a rough idea of the direction a design might take. form or in the picture using the tissue paper. Ask questions to probe for misunderstandings and help young designers where necessary. Point out that the skirt should have a lot of fabric at the bottom and not at the top. A plain rectangle has almost the right amount of fabric at the top but not enough at the bottom. Start with a rectangle cut from plain paper. Cut the rectangle into strips and spread the bottom part out to show how to turn a rectangle into a flared skirt (see diagram). Have them try this with tissue. This shape is flared: a lot of fabric at the bottom and less on the top. Flared skirts can have varying levels of flare; skirts with a lot of flair are made from a full circle. There are three options for this skirt design, each progressively more flared. Q: Why is it not just a tube? YOUR Answer: Using the same amount of fabric at the waistline as the bottom does not allow for the skirt’s flared hem. It will either result in equal widthall the way down the length of the skirt, making ittoo tight at the bottom or it will create excess fabricat the waistline. Think about how to vary the amount of fabric from the waist to the hem. Q: Why is it not a trapezoid? A: All of the extra fabric will be collected at one point of the skirt. The flare in a circle skirt iscontinuous around the design. Think about how to spread out the extra fabric. Q: Should it be one or two pieces? A: The circle skirt can be made with one or two pieces. Various arcs or circles like those shown here can be joined to make one skirt. Think about how the amount of flare would change as more is added to the circle. Q: Why must the bottom edge be curved? A: This is to allow for an even bottom hem. 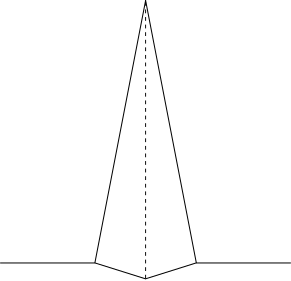 Illustrate this phenomenon by wrapping a piece of rectangular paper into a cone, and then trimming it evenly. Once a level base is achieved, flatten to show its 2D shape. Point young designers to the gathered skirt mood board in their notebooks. Discussion Point: Where is the fabric close to the body? How is it held close to the body? Where is it away from the body? Instruct the young designers to try to make the shape with the tissue paper. make the skirt on the dress form using tissue paper. Ask questions to probe for misunderstandings and help young designers where necessary, and see At-a-Glance to answer common questions. This fabric is gathered: scrunched in and sewn at the top. This is also known as a “dirndl” skirt. The students should arrive at a rectangular shape pattern. The width may vary, the wider the fabric, the more gathers. Q: Why will it not be the same design as the circle skirt? It seems like a similar silhouette. A: The skirt is gathered together at the top and smooth at the bottom, rather than having a smooth waistline and wavy bottom. These gathers are what differentiate the two skirt designs. Think about what flat shapes are needed to create these two shapes. A: While this shape does have the flat waistline and bottom for the gathered skirt, the additional fabric on either edge will create an uneven 3D hemline. All of the extra fabric will be collected at one point of the skirt. Think about how to keep the level waistline and hem without the extra fabric. Q: Is this skirt gathered and flared? A: Many skirts use a combination of the two techniques. In a basic gathered skirt pattern,however, only gathering is used. 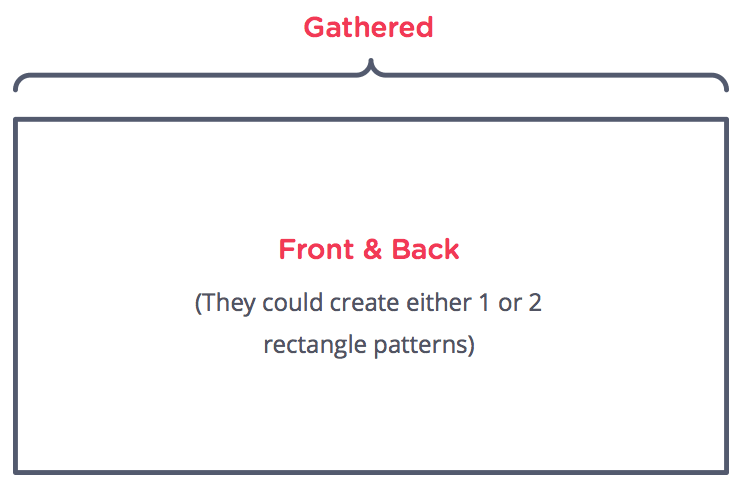 Think about how the bottom edge of the pattern shape is affected by these two options. A: The gathered skirt can be made with one or two pieces. Because it is a rectangular shape, the number of panels will not affect the shape. Think about the benefits of each option. Point young designers to the fitted skirt mood board in their notebooks. Discussion Point: Where is the fabric close to the body? How is it held close to the body? Is it away from the body anywhere? make the skirt on the dress form using tissue paper. Ask questions to probe for misunderstandings and help young designers where necessary. Reference At-a-Glance sheet to answer common questions. Emphasize how the waist and hip are different sizes and how there must be a way to remove the extra fabric at the waist. Discussion Point: Is the waist the same size as the hip? What happens to the extra fabric? Discussion Point: Did you fold in the same amount of fabric in the front and in the back? (Depends on dress form shapes but typically back darts are bigger than front darts). This angled fold is called a dart: fabric is folded and sewn to a point in a triangular shape, to fit the body. The solution is to fold in excess fabric, making “darts” at the waist. The curves at the side of the body could also be fitted with darts if they are making a one-piece skirt. Q: Will the waist require the same amount of fabric as the hips? A: No. This skirt is fitted in both places without any gathers, so the waist must be smaller than the hips. Think about where the extra fabric must go. Q: When should darts be added? 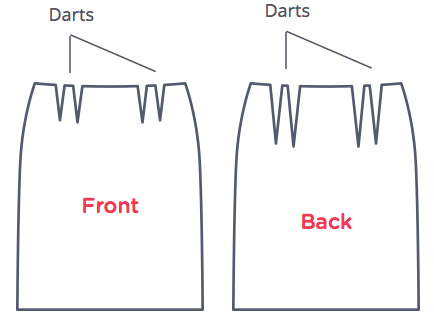 A: It is important to fold in the darts after putting the tissue on the form. It would be hard to know exactly where to put the darts for a smooth waistline without having the form underneath. Q: What is the purpose of the darts? A: The fitted skirt with darts is different from other skirts because the waist is smaller than the hips without gathers or flares. Think about how this is achieved. Q: How can both the bottom and the waistline be fitted without having gathers? A: The bottom must be wider than the waistline. Rather than have an equal amount of fabric at both ends and altering the width as with the gathered skirt, think about how to have more fabric at the bottom than at the top. A: The fitted skirt with darts is generally made using two pieces, a front and a back. end while keeping the other end tight. Place flared skirt on dress form again. It looks somewhat like an upside down peg skirt. Do you think we could use a similar strategy to make a peg skirt? 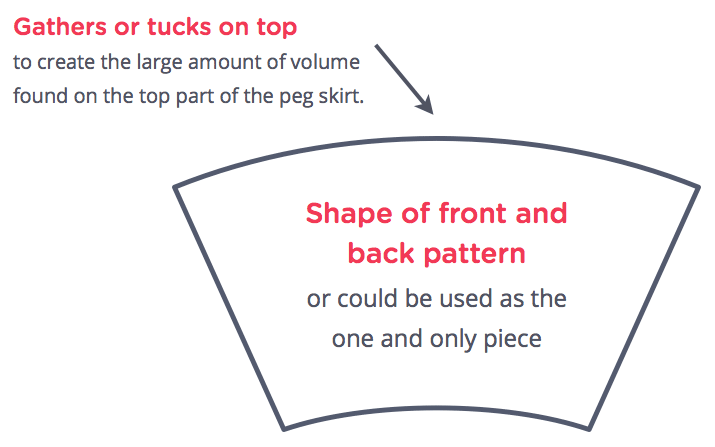 The simplest peg skirt pattern shape is an upside-down version of the flared skirt. Again here, they can make a front and a back or they can use one piece for the whole skirt. Q: Will the bottom require the same amount of fabric as the waistline and hips? A: No. In this skirt design, the bottom is more fitted than the hip area. The waist is fitted however, and smaller than the hip. Think about how to achieve these relationships. Q: Why does it not require darts or gathering? A: Darts are sewn flat, and would not show the fabric folds we see at the waist. Gathering is one possibility, but it would not provide the smooth waistline pictured in the examples. Think about another kind of fabric manipulation that could achieve the correct look. Q: Why is it not an upside down trapezoid? A: Think back to the flared skirt. In the same way, all of the extra fabric will be collected at one point of the skirt instead of an even waistline. Curved seam lines allow for a level bottom edge. Think about how to manipulate the flare skirt pattern to make a peg skirt. A: The peg skirt can be made with one or two pieces. Two pieces will create a symmetrical waistline between front and back. One piece will create an arched waistline, with the higher part of the arc directly opposite the seam line. Hand out the evaluation question. 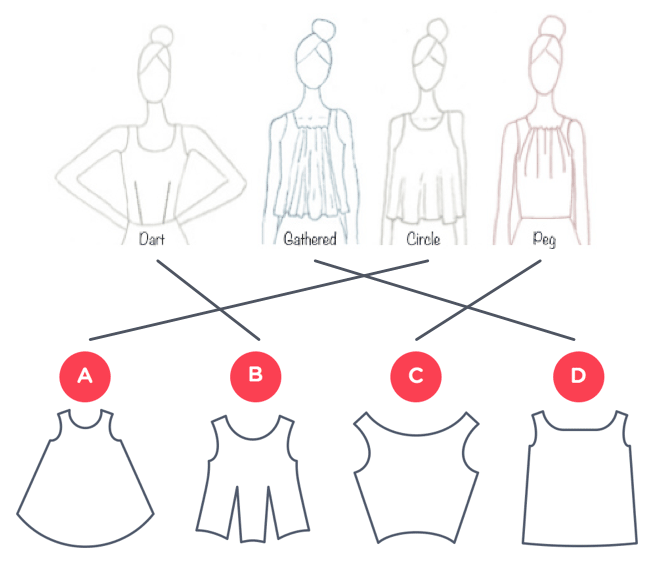 Match each of the following tops with the kind of draping they illustrate, applying the techniques learned in the skirt activity. would the 2D shape change? What would the flared skirt look like if we gathered it? We can use it as the front half of a skirt (pin it into a gathered skirt front). How is this one different from the dirndl skirt? (The hem is fuller on the flared skirt). What would the flared skirt and the dirndl skirt look like if you spun around? (They can try it). (The flared skirt flies up/out, the Dirndl skirt makes a bell shape). If we cut out our flared skirt shape from striped fabric, how would the stripes look? (The stripes would angle in different directions at different points around the body–they would not be vertical/horizontal). Is the waist the same size as the hip? What happens to the extra fabric? Take this activity one step further by looking at other skirt shapes on the internet or in magazines, and trying to analyze the pattern shapes that would create these skirt shapes. Look for skirts with yokes, pleated skirts, skirts with hi-low hems.